Retail $2.60 SAVE 20% ! "Excellent tape with no bleed under"
This tape is excellent for masking. If you burnish the edge down and are careful there is no paint bleed under. I use this for my fine masking, then use a wider tape over part of it to cover more of the area I don&apos;t want painted. I have not had a problem with this tape pulling the undercoat paint off of the model, as long as I let is dry. "Great For Masking Small Areas, But Not Good For Curves"
This is a great tape to mask fine lines and in tight spaces. I use it almost every time I paint. It can also be used as a stripe tape where one wants to keep the space between stripes at the same width as an outer stripes. Using the full collection of widths available, some interesting results can be obtained. 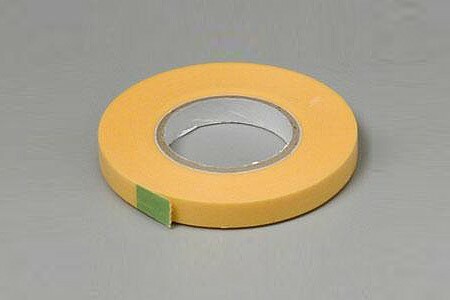 If you want to tape curved lines or cut a clean curved lines, this is not the tape to use. Other tapes are designed for curves and leave much cleaner line. I will be using this tape on all my models from now on.It works great and you get a lot of tape per roll. "Works great and lasts a long time"
This tape stays put, removes with no residue, and does not leak through even with heavy coats of paint. For masking glass canopies, I lay the tape down and cut the edges with a xacto knife. Because this is a paper tape, there are some fibers left over on the edges, but it doesn&apos;t affect the end result. This tape lasted me through more than six models, and the 6mm width was just right for every one of them. Also, try not to touch the sticky side with your hands before using it (obvious, I know)-- it really affects how well the tape will stick.